Shuto League off to a Swift Start! Cru’ was more agile than Swift RFC? The first competition match of the season got underway on 2018 September 16 with our first match against Swift. Having lost to them at the end of last season we were certainly keen to get back our own. The day started right with a multitude of numbers to adequately fill all positions, and everyone being on time to boot. We arrived at the awesome facilities of Inagi Nagamine with a hot sun overhead after a brief hike from the bus stop, which left those of us in our blazers perspiring somewhat more than we had intended. Nevertheless, we got the warm up underway at once and felt enthusiastic and optimistic. After spending the first seven minutes in our own half, Swift struck first after a quick-tap penalty on our own ten meter line caught us off guard. If anyone thought this was going to be a repeat of the last match they didn’t convince the noble fifteen. After some back and forth and staunch defense, the Cru struck back with Dom touching down at the 20-minute mark and Susumu slotting the conversion to even the score at 7-7. More hard fighting ensued until debut #9 Yori crossed the line 3 minutes before the half, with Susumu converting his second kick to make the score 14-7 at halftime. This seemed to provide encouragement and just 4 minutes after the restart Dom completed what would be his brace of tries. The conversion sailed wide but We were now up 19-7 and growing more confident. 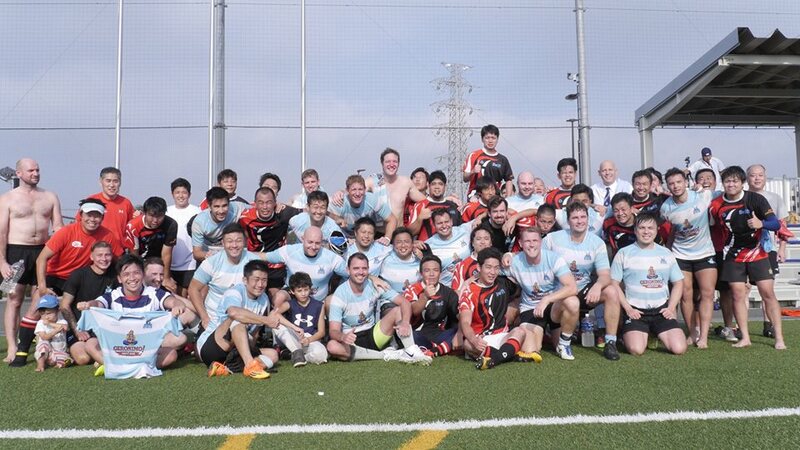 After Yasu later crashed over and Susumu converted to make the score 26-7 we looked certain to win. However, that certainty dissipated a bit when we received two yellow cards with 10 minutes to play, leaving us down to 13 ment against 15, and that 15 included a fast and agile back line that showed us this game was not over yet. But fear not, dear reader. We managed to hold them off with some great defense from both the forwards and the backs. When the whistle finally blew, we had our first competition match win of the season. Final score: Crusaders 26 – 17 Swift. Afterwards we hit the okonomiyaki shop in Inagi where we ate and drank to our merry content before heading into Shinjuku. From that point I either can’t or won’t say what happened. Stay tuned for what will hopefully be a string of victories in our 2018/2019 quest for Shuto League Gold.